Three views of the Apollo Basin taken with NASA's Moon Mineralogy Mapper instrument on India's Chandrayaan-1 spacecraft. 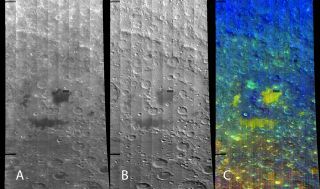 The false-color image on the right reveals composition, which can help scientists discover the history of the moon's surface and impact craters. The rocky worlds of the solar system may bear scars from the debris that didn't quite make the cut as planets, a new research suggests. Billions of years ago, when the solar system was very young, showers of material slammed into the infant Earth, its moon and Mars, in a period known as the Late Heavy Bombardment (LHB). For years, studies have suggested that a group of rocks that now surround the modern-day asteroid belt between Mars and Jupiter were responsible for that early hammering of the inner solar system. Those rocks would have been thrown toward the sun as the gas-giant planets settled into their present-day orbits. "We have evidence for two early-bombardment populations and a time difference between them — a late one, plausibly made by escapees from the asteroid belt, and an early one from elsewhere," William Bottke, an impact scientist at the Southwest Research Institute in Colorado, told Space.com. Bottke presented his ongoing research on this subject at the 229th meeting of the American Astronomical Society in Grapevine, Texas, earlier this month. The research is based, in part, on new simulations he has run in the past few months. Over the past decade, as spacecraft have gathered more detailed looks at the moon and Mars, and models have become more sophisticated, Bottke found himself growing less convinced that the massive scarring on both worlds came from objects that originated in the asteroid belt. The young solar system was a chaotic home filled with collisions. One recent model of those early days, known as the Nice model, suggests that the gaseous outer planets (Jupiter, Saturn, Uranus and Neptune) formed much closer together, while populations of rocky, icy material clustered at the borders. As the gas giants engaged in a complex dance to move into the positions they occupy today, their gravity might have scattered both the icy, rocky material that would become the Kuiper Belt (the band of objects beyond Neptune) and the rocky material of the asteroid belt, the Nice model suggests. Most asteroids orbit the sun within a broad belt located between the orbits of Mars and Jupiter: the asteroid belt. Get the facts about the asteroid belt in this SPACE.com infographic. According to Bottke's fellow SwRI researcher David Nesvorny, the outer solar system (which includes the Kuiper Belt and the larger Oort Cloud) probably housed another Neptune-size world. The planet, which eventually would have been flung out of the solar system completely, would have pushed Jupiter into its present-day orbit, he said. These dancing planets probably played a role in the Late Heavy Bombardment, the brief escalation of material crashing into the moon and terrestrial planets 3.8 billion to 3.9 billion years ago, Bottke said. Weathering and tectonics erased the evidence of the LHB on Earth, and planet-wide volcanic activity might have covered up the proof on Venus. But Bottke said Mars and Earth's moon still show signs of their history. Without wind, rain or earthquakes, traces of these bodies' acne-scarred youth remain permanently etched on their surfaces; billions of years of activity remains visible for explorers to see. By looking at the scarring, in combination with new studies of the moon and techniques for modeling impacts, Bottke found that the LHB might not have been the brief, intense uptick in activity many scientists hypothesize it to be. Rather, the ancient basins formed by collisions on the Martian surface seem to have come from objects that originated in the inner and central main asteroid belt, he found. Bottke's simulations show that the moon would have been hit by only a quarter of the material its scars reveal. "The question is, what made the most ancient craters and basins on the moon?" Bottke said in an interview with Space.com. In his presentation, Bottke suggested that the craters on the far side of the moon were drawn from a completely different group of objects than those found in the asteroid belt. Speaking of the impacts on the moon, he said, "That doesn't look like any population, really, that we have." As he has studied the evolving evidence, he's come to think that perhaps something other than the asteroid belt hit Mars and the moon and, by extension, the Earth. Although Mars and Earth's moon show visible evidence of their scars, that evidence can be challenging to interpret. Samples from the moon are limited to those returned in the 1970s by the Apollo missions. Although the samples were gathered from various places across the moon's surface, some scientists think all of the samples might have come from a single basin, which would explain why they are all roughly the same age. Martian samples are similarly limited, arriving as meteorites on Earth, with no context of where they came from or what their early life might have been like. Future missions may return samples from Mars and the moon, but current missions have improved the mapping of the two worlds in the interim. Bottke pointed to NASA's Gravity Recovery and Interior Laboratory (GRAIL) mission to study the moon, as well as other similar missions that have helped build a more detailed map of Mars. The detailed maps allow scientists to study craters of all sizes more accurately, thus improving scientists' understanding of how material slammed into the two worlds throughout their lifetimes. At the same time, advances in computing have allowed for more detailed simulations of how material in the early solar system might have behaved. Meg Schwamb, a planetary scientist at Yale University who attended Bottke's talk and is not involved in the research, found the idea of a more dispersed bombardment period interesting. "It doesn't put any holes in the Nice model," she said, which provides a good explanation for the formation of the Kuiper Belt. What she'd really like to see is how the impacts on the moon and Mars compare to those on the surface of Mercury, whose lack of volcanism means it should carry the scars of its youth. Bottke isn't alone in thinking that the LHB might have come from beyond the asteroid belt.. A recent paper by Nesvorny, for which Bottke provided earlier models, argues completely against the need for a bombardment. Nesvorny holds that the lunar scars make it unlikely that the falling material came from the rocky asteroid belt between Mars and Jupiter. In an attempt to reproduce the scarring on the moon and Mars today, he modeled the motion of the gas giants that could have flung asteroids toward the inner planets (called a dynamical instability). "We find it unlikely that asteroids could be responsible for the LHB, independently of whether the dynamical instability in the outer solar system happened early or late," Nesvorny said in his paper. Nor did he find comets to be the culprit. With orbits that reach out into the Kuiper belt, comets were also stirred up by the dance of the gas giants, and many of them were tossed toward the inner planets. When Nesvorny modeled their disruption, he found that the comets also failed to produce the desired results. Instead, Nesvorny proposed that the material responsible for carving the enormous craters on Mars, Earth's moon and the early Earth came from debris left over from the formation of the major planets. Those "planetesimals" would have been larger than the objects in the asteroid belt, according to Nesvorny, and would have collided with the inner planets at a different time. At least one Mars-size body is believed to have slammed into the Earth to create the moon. Other, smaller planetesimals might have carved out the pockmarks visible on the solar system's rocky worlds. The planetesimals that weren't destroyed when they crashed into worlds were cast out of the solar system by Jupiter's gravity, according to existing theories. But Bottke isn't quite ready to dismiss the LHB completely. Though the second, later impacts might have come from young planetesimals, he still thinks the early cratering on Mars may have originated from asteroid-belt objects. Over the past few weeks, as Bottke has continued simulating what could have happened in the solar system, he has thought that the case for the asteroid belt has grown. "The bottom line is that I believe the case for the LHB — defined as a fairly late uptick, not a narrow spike of impacts — has gotten stronger in the last two weeks," Bottke said in an email to Space.com. "The precise form the LHB took is a more involved question that I need to explore with David's data." Follow Nola Taylor Redd on Twitter @NolaTRedd Facebook or Google+. Follow us at @Spacedotcom, Facebook or Google+. Originally published on Space.com.